Friends or Enemies? What have Councillors, GPs and Directors of Public Health got in common? As public health moves over to local government and Health and WellBeing boards are established some of the key players need to understand each better. Here is a quick list that highlights some similarities and differences. With thanks to some (anonymous) colleagues of a well known national organisation. By the way – I have not put GPs down as being responsible for making strategic decisions – this is because I am still not convinced that ALL GPs will be personally making strategic decisions that affect whole populations – this is something that Councillors and DsPH are of course already responsible for. What are your suggestions for similarities and differences – let me know and I’ll add them to the table. ← Healthwatch set up to fail? Interesting analysis Mark. Wonder who’s more likely to use NHS or have private health insurance? Info probably not available? Great question Ann – I think we both could get at the answer here. A quick scan of the web brings up an article from the Daily Mail (http://bit.ly/wTtw5P) Feb 2007 which claims that 28% use private health insurance. Mark, don’t forget the other key players on the HWBB: Director of Children’s Services, Director of Adult Social Care and local Healthwatch. The dynamics will be considerably more complex than ‘us and them’, particularly in two tier authorities. District Councils, with their responsibilities for sport, leisure, housing, planning and environmental health, should have a big impact on local health & wellbeing but are not part of HWBBs. …of course – you are quite right. This table has a serious intent but is a fairly light hearted look at some of the new players and relationships. I was particularly interested in highlighting the common ground and differences between councillors and GPs who have a shared agenda with regard to local delivery and are the fact that they see individuals face to face. Playing in the DAS and DCS would be interesting – not least because one of the areas where they are different to the DPH is that they are responsible for very big commissioning budgets which are not ring fenced. All three – DAS, DPH and DCS share a common accountability to councillors. Your points re District Councils and Healthwatch are perfectly fair. This is great Mark and a really interesting tool from a perspective of understanding what makes a successful partnership. Might also be interesting to explore challenges to partnership working, e.g. Also on the flip side it would also be really useful to find some areas of common ground where actually all three boxes could be ticked, e.g. 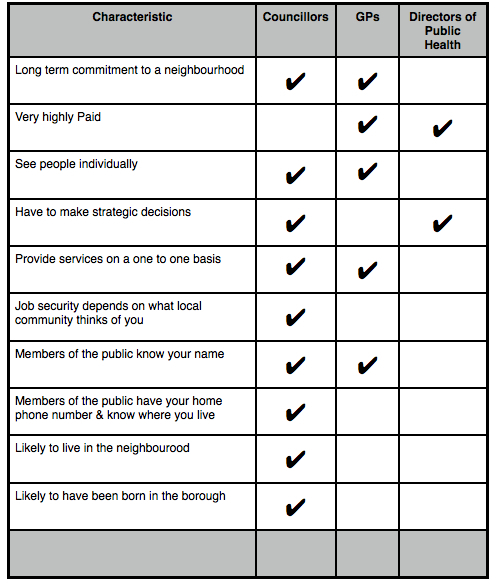 Thanks Chim – yeh you have identified an area that I struggled with – I do think that many good councillors would see there role as advocating and helping their constituents tackle really complex local problems – I think that GPs are probably more likely to see their role as responding to those that have a clear clinical solution. Love the table – and have shared! It would be interesting – and useful – to look at the skills the Healthwatch ‘representative’ will need in order to fullfil their role in a meaningfull manner – as well the the support structures and knowledge that one person will need. it will be hard for an as yet undeveloped (and potentially poorly funded and staffed) body will be able to match the support systems available to elected members, GPs, directors, etc. From the start, I’ve been unconvinced that the structures themselves do much togive this position any power and make it meaningful – doing so will rely on local will and the HWBB itself. Thanks Helen – its interesting – I do think that Healthwatch has been dealt a challenging set of cards – I agree much will depend on external factors such as the ambition of some of the players you mention. However, I also think it will be about creating a different sort of organisation to those such as LINks in terms of skills and capability – I will be bunging something up on the blog about this in about a weeks time – so watch out for it!